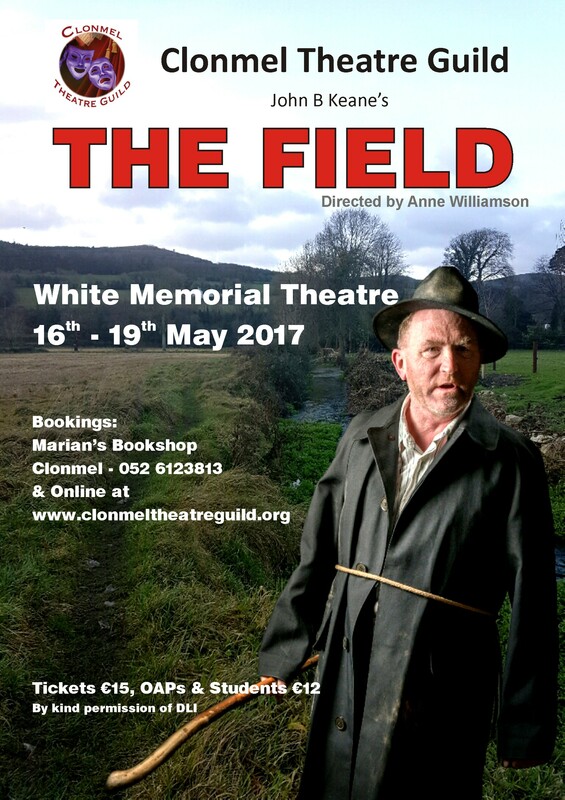 Clonmel Theatre Guild is delighted to announce our next production is John B Keane’s powerful drama “The Field.” Directed by Anne Williamson this production will be staged in the White Memorial Theatre on 16th-19th May 2017. The Field is perhaps John B. Keane’s best known play. This powerful play has the ‘Bull’ McCabe as its central character. 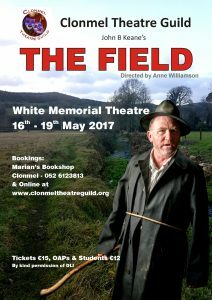 ‘The Bull’ is a tenant farmer with a ferocious temper and an obsession with the field he has been renting from a poor widow. After years of backbreaking toil, McCabe has transformed the field from three acres of rocky wasteland into a lush green pasture. But when the widow decides to put the property up for auction without considering his work, an outraged McCabe is determined to buy it at all costs. Unfortunately, there is another interested party, an English man whose plans for the field include paving it over and turning it into a cement block factory. ‘The Bull’ cannot stand to see the land he so deeply loves slipping away from him. He decides to deal with the situation in the only way he knows and his actions have tragic consequences. The play shows the after affects on ‘The Bull’ and those around him. We are very excited about this production and are really looking forward to rehearsals over the coming months. A donation from the opening night’s raffle will be made to Brú Columbanus, which provides “home from home” accommodation for relatives of seriously ill patients in any of the Cork Hospitals regardless of where they come from.